Thought you would enjoy the picture, Dennis. Loved it! "Hi Dennis. We got back a week or so ago from our first trip with the trailer. We met friends from CO on remote BLM land above the Dirty Devil river in southern Utah. Did a lot of hiking and biking. Temperatures ranged from hot and windy (with a lot of blowing sand) to light snow. Trailer was great. It was much cooler and less sandy than the tents on the warm days and warmer on the cold nights, although we failed to bring our sleeping bags and were a little cool at times. The dirt road going into our camp area turned our to be unexpectedly rough. One section was steep, off-camber, and had slick rock ledges. The trailer did fine and the trailer was almost unnoticeable on the highway. We loved the trailer and look forward to heading out soon. I'm not much of a photographer, but I attached one photo of our campsite." "Dennis : I just wanted to send a word of encouragement after your last two Facebook posts. Your attention to detail, design and amazing wood craftsmanship is what sold Dave and I on buying a High Camp trailer. Indeed waiting for our trailer might even be harder than saving the money to pay for it. But I have no doubt it will be worth it. We are so looking forward to the places we will go! Thank you and your team for all the dedication and time it takes to creating such a beautiful trailer." "I’m sorry I haven’t got in touch with you sooner. As a matter of fact I am using the teardrop as I pen this e-mail in Joshua Tree National Park. I couldn’t be happier with the trailer. It’s really living up to, and surpassing expectations. There is one problem however, it’s draws people to it like bees to honey. LOL. I’m sure you’ll get some inquires. Seriously I love the teardrop, and you will receive those pictures soon. "Dennis, We are on our last night in the Teardrop in Zion National Park. After 4+ weeks in it we are more in love it each day. The exquisite detailing and craftsmanship impresses everyone. The retro styling including the metal strips that appear to have rivets is so 1930's. The soft led lighting in the galley makes the birch glow at night. We've been approached by large RV owners, campers & even people in parking lots who want to get a tour. I've given out lots of your cards. Hopefully you'll get some orders! Thanks again for doing such a masterful job on the design & the construction. "To Dennis and Chris, at High Camp Trailers, I cannot offer enough praise. They are dedicated to their craft. 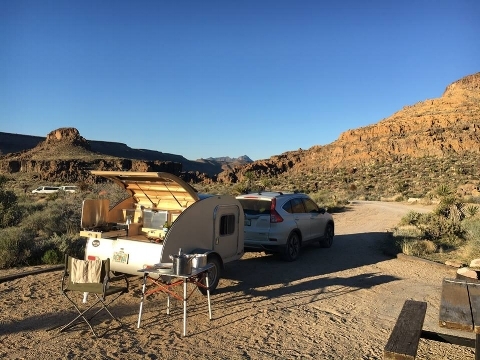 If any of you are interested in finding a teardrop trailer, look no further. You would never regret buying a High Camp Trailer, unless its just not big enough for your needs. And the bonus is a trip to the Pacific Northwest." Thought I would send you a pic of the High Camp all set up at Kalaloch Camp ground in the Olympic National Park. We spent 3 nights there. Everything worked just fine and we had a wonderful time! You wouldn’t believe the attention we got from the moment we drove in till the time we pulled out. The guy tenting next to us took pics and said how good one of these trailers would look good behind his 56 Chevy." "Dennis, Just returned from 3 weeks camping in Montana, North Dakota, South Dakota, Minnesota, Idaho and Wyoming. 4,700 miles and the trailer performed fanastic! Got thumbs up wherever I went. Everyone wanted a tour and appreciated your craftsmanship." First off, WE LOVE OUR teardrop!!! The workmanship is exquisite! We slept In it in the garage 3 or 4 times before taking it outside. It was more comfy than our indoor bed! That didn't totally bond us until we really got out and tried everything. Now we are bonded! Ironically, our best pals found and bought a 2013 high camp trailer in the community close to ours. They bought it before we could show off ours. Both models are great! We did our first camping trip together. They are tickled pink over their trailer and we looked like a convention. Thank you again for putting so much love into the construction! " "As an owner of one of these beautiful trailers, I can't say enough great things. I searched high and low for 3-4 years before choosing High Camp. I wanted a great looking trailer that was high quality, functional, and easy for me to handle alone. The High Camp has met and exceeded all my specifications. The craftsmanship and attention to detail that Dennis provides is unmatched anywhere. If you're thinking about one of these, don't hesitate. Its great any time of the year!"